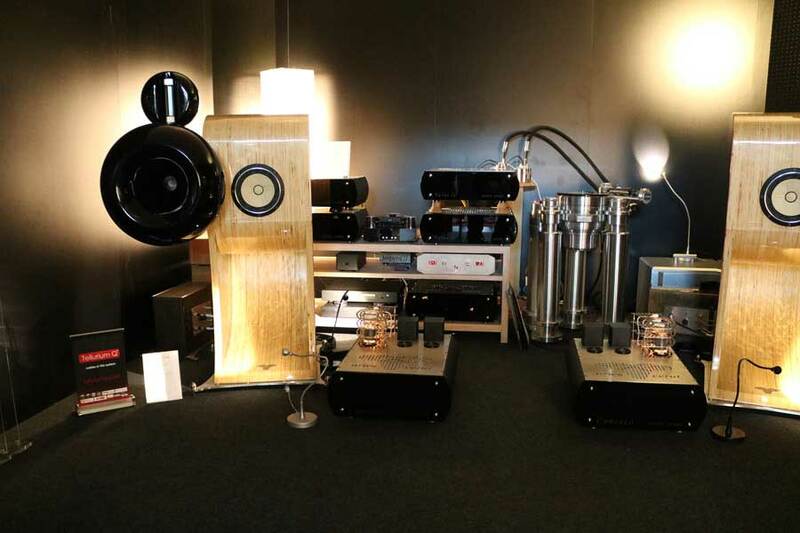 Our Australian distributor Purasound pulled off an amazing system during the last Melbourne show. Full AC system comprised of the Limited Edition Symphonia speakers. Amplifiers on hand were the Genus integrated(on power amp mode,resting on a nice Staccore platform) and the Diana Forte SET power amp.Forte took the lion's share of the time pie. Sources were Kassandra Ref dac fed through a Pink Faun sever. The Talos Ref dual chassis phono didn't had a chance to participate to the party as a transportation accident of the TT tonearm was show stopper. Preamplifier duties were handed to Incito S with it's first show presentation. The system was set in two different walls for the three days of the event.Robert , changed system orientation in the room on the second day with more than worthy sonic improvements.Not an easy task with an almost 1 tonne system. Full electronic stack included the Impera II Sig acting as preamplifier with Genus taking the lead as power amplifier. with the awaiting launch of the Concero Sig and Concero Limited Edition single ended amplifiers. "Aries Cerat Incito S, a tube line stage beyond boundary?!" Thank you Danon Han Hong Denfor a great write up. ""The Incito S preamplifier achieves that rare feat of balancing the lovely qualities of both tube and transistor equipment to present recorded music as it should be reproduced. The transparency to each recorded musical note was uncanny and surreal."" First pair to be shipped out soon. Proud owner in Belgium,enjoying a full AC system ,build around the Symphonia horn speaker. ""When someone, whose opinion you trust about high end hifi, tells you that a room sounds so beautiful it moved them to tears…you make sure you go into that room and have a serious listen. Jack at BD Audio had not steered us wrong! A visually stunning room featuring Aries Cerat Symphonia horn loudspeakers, that are wonderfully made from wood, and their hefty Concero 65 monoblock valve amplifiers, plus more of their electronics. There was an equally stunning Vyger Indian Signature turntable, 432 EVO music server and the system was fully cabled with Tellurium Q Silver Diamond with Ultra Silver power cables. Now this is all very high end gear, it’s big and unashamedly bold so a feast for audiophile eyes as well as ears. They were playing classical music when we went in, normally not something that appeals to me but if music that I don’t normally listen to can captivate me then it’s a good sign. It really was simply stunning and definitely one of the best sounding rooms at the show…also one that we will make a beeline for next year and hopefully get to hear a wider variety of music too."" Due to some technical problems from our email server, a lot of incoming email have been dropped. sigmadane at yahoo.com until we resolve this matter. After an amazing Munich show,our room has been awarded with the Gold Show Award from AVShowroom!! Thank you Peter and Terry Breuninger for your very honorable comments and Award. Aries Cerat want to express it's appreciation for all visitors of our demo room,at the recent Munich Hogh End show.You visit and comments are highly appreciated. We will be showcasing our newest pride,the Limited Edition Talos phono stage. We welcome you to share our experience with our most exotic design yet. Analog sources will be our new pride the Talos Limited Edition accompanied by VYGER TT and Air Tight PC-1 Supreme. Digital source will be our Kassandra Sig fed by the EVO 432 streamer. Symphonia Aeneus speakers will be driven by our Concero 65 amp/Impera II combo. Another proud moment for our Kassandra Series ,the Kassandra II Limited Edition DAC was awarded with the Ultimate Digital Component of Analogue Fellowship for 2016-2017. I have a number of visiting audiophiles that came into my audio den and agreed with me how the Kassandra 2 SLE was so special, that it was comparable in performance with the top analogue sources in my audio system. I could assure you, that it was not an easy statement to write and surely not one to digest especially to an "analogue first audiophile". It brings me a great pleasure (with a humbled heart) to announc that the Kassandra 2 SLE DAC as the Ultimate Digital Component of Analogue Fellowship for 2016-2017. Finally, where is my cheque book? I am KEEPING KASSANDRA 2 SLE DAC! We are proud to announce the word debut of our new Concero 65 monoaural amplifiers,taking place at the biggest show in Belgium,the New Music High End Innovation show. A full Aries Cerat electronic stack will be supporting our newest proud achivement. We proudly announce that the Diana Series,will soon aquire two offsprings. We proudly announce the launch of our brand new Collatio II Single Ended OTL amplfier!! We proudly announce that our Incito pre-amplifier,was awarded the Blue Note award, as one of the best products of 2015 , by the fellows of Enjoy The Music Audio magazine. ".....Out of the gate, the Gladius is a fully formed mature speaker. It's far from the mainstream but carries with it easily quantifiable design and performance excellence. That puts it up there where the air is thin, the vistas grand and dreams of better faint memories. What a debut for a 'conventional' speaker!..." "...It simply means that for all its timing accuracy and speed, this speaker doesn't lack tone or body to require a thermionic injection. I achieved the greatest dynamic responsiveness, articulation and life charge without any valves in the signal path in fact. This reiterates my above claim that the Raal, Fostex and Acoustic Elegance transducers here are truly top spread and endowed with built-in tonefulness..."
"...The Gladius from Cyprus newcomer Aries Cerat is a very serious attempt at a state-of-the-art floorstander of still friendly dimensions. For €22.000/pr the buyer gets very worked-out external crossovers, inert cabinetry with 'wind-tunnel' head units and three carefully selected and modified drivers per side which must be amongst the top available options in their respective bandwidth windows. Anyone sufficiently familiar with the industry can quickly calculate that the tall sticker buys rather more in materials and execution than is the current norm. It's why despite the new-car price this is actually quite a value proposition for the wealthy..."